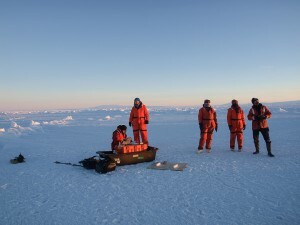 We’re rapidly reaching the end of the PIPERS Expedition to the Ross Sea. The cruise was planned for 66 days; in the end it looks like it may be 62 days to account for some fuel calculations and a safety margin for weather. But that’s not all we’re reaching the end of….. 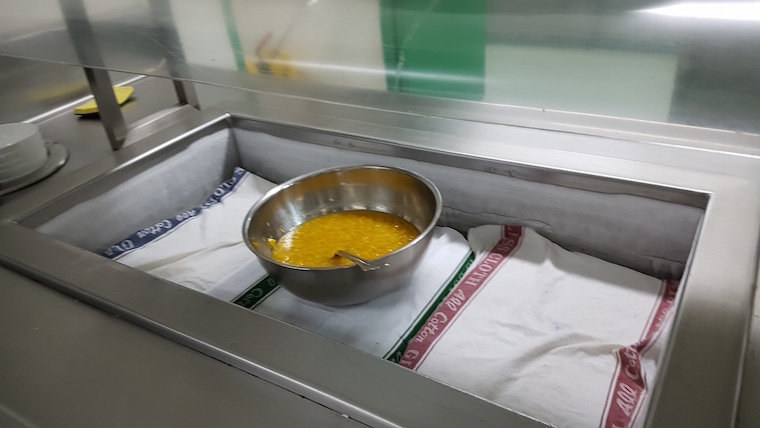 In fact, we have seen the last of many of our favorite foods, which we get plenty of on land, but which don’t always last when you spend two months at sea, without a supermarket in sight. The first things to go are usually the leafy vegetables, and when they go you think, well I won’t miss you that much, because we don’t always consider salad the “best” part of the meal. That’s usually dessert, right? Out here, things go completely upside down. It’s not uncommon to hear “what I wouldn’t give for a juicy tomato” as someone stops to pick up a slice of cheesecake in the spot where the salad bar used to be. That’s right, we miss you, salad bar! We would gladly get you back, in exchange for our banana cream pie. Salad bar, toward the end of the cruise. It’s not that we don’t appreciate the desserts or any of the dishes that we get, but there is a variety that we’re used to on land, which doesn’t hold up out here. And PIPERS was a particularly long cruise, so we have run out of a lot of items in the past two months. Like all humans everywhere, the PIPERS participants like to talk about food, so the disappearance of one item or key ingredient, doesn’t go unnoticed for long. There was the day that we ran out of Ketchup. That caught everyone by surprise, because we were only a few weeks into the cruise. Fortunately, Chef Nena (check out more on Nena) improvised and whipped up some home made ketchup, which was actually better than the Heinz or whatever brand we had before. There was the day that Corn Flakes ran out. Actually, all the cereal except Trix ran out over the course of a week. Fortunately, Jeffrey the head Chef filled in the gaps with oatmeal, pancakes and plenty of eggs for breakfast, but no more midnight bowls of cereal. I personally breathed a sigh of lament when the raisins ran out. There was the week that rumors swirled about the yogurt dwindling to nothing – folks were starting to stockpile in their cabins in preparation for the coming famine. It turns out those were just rumors at the time, but the yogurt did eventually go a few weeks later. The hot foods offer more variety. 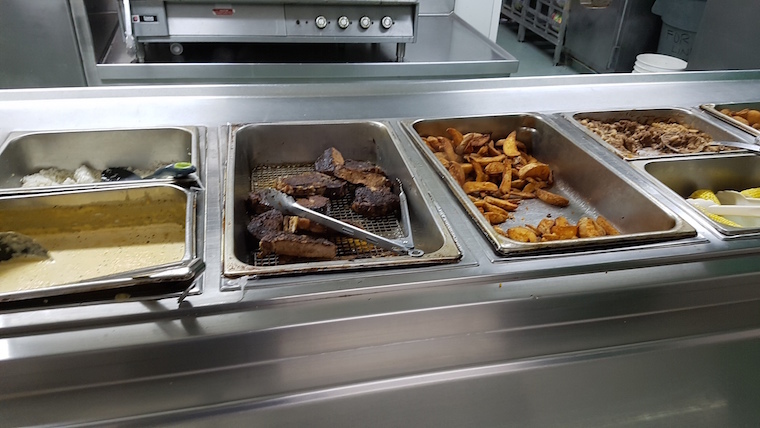 All in all, we still have plenty to eat, and it’s not uncommon to put on a little extra weight when we’re at sea, ahem. They feed us three times a day and we can only go at most 300 feet in any direction, so the exercise routine slips a little. In a way, running out of certain foods just makes the prospect of reaching land that more ‘delicious’. The talk of first meals, first beverages, first activities back on land is mostly how we pass the time in the galley these days. Won’t be long now! Out here in the Southern Ocean, surrounded by ice and darkness, things can get a bit lonely. 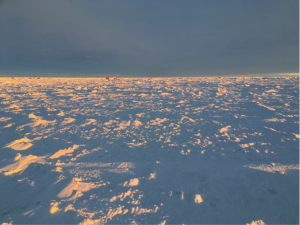 As we slowly work our way north through the ice, stopping for Belgian Biogeochemical Stations, for Autonomous Underwater Vehicle missions, and to drop buoy arrays, we wait for the sun to rise again, and we daydream about what we’ll do when we get home. 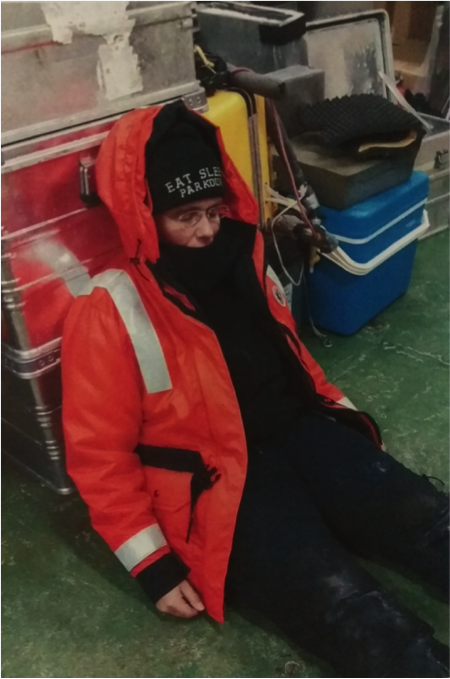 Fortunately, we have been getting regular updates from our friends, family, and followers on land who let us know they are keeping close track of our progress and talking about the life and science aboard the NBP ice breaker. Thanks to everyone who has sent us messages and posted on the blog. With this post, we want to give a shout out to everyone out there who has been keeping track of our progress! Let me tell you about a few of them. PIPERS has a West Texas and Mexican Caribbean connection thanks to the work of Annie Wiesling who is completing a PhD in education. Annie hails from the town of Xalaopa in the state of Veracruz, Mexico. 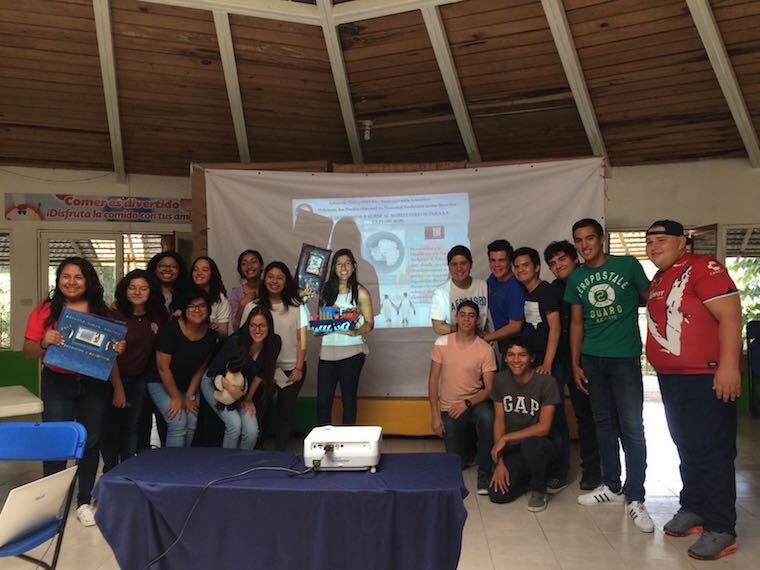 Her deep roots in the town mean that she is still active in promoting education in Xalapa. Annie has partnered with the Julie Soto who teaches technology at the Escuela Simon Bolivar at the Briones Campus. 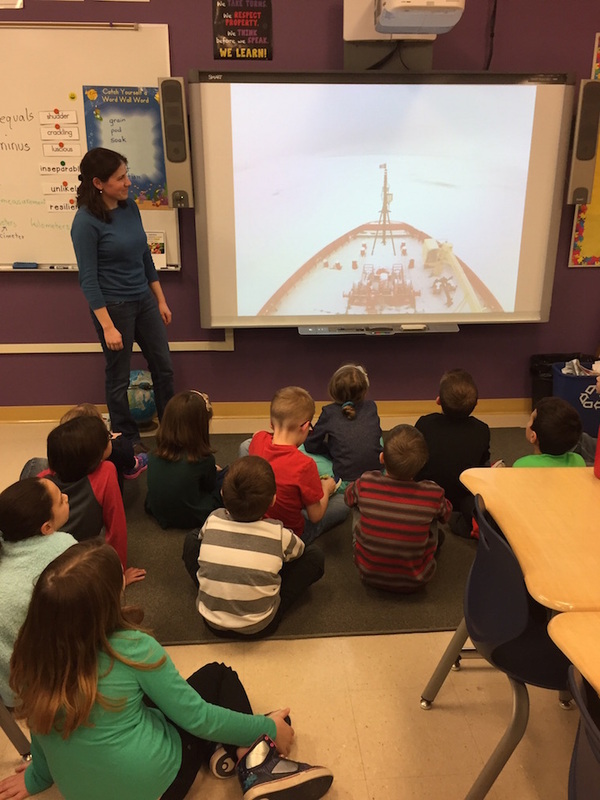 Starting in 2007, a group of students has been studying polar exploration and sea ice issues. This group (pictured) is about to graduate secondary school, but they are active in making the younger grades at Simon Bolivar interested in polar studies. Together, Annie, Julie and the students maintain a Spanish-English blog titled: http://antarcticnbp17.blogspot.mx. Have a look if you get the chance! Students at Simon Bolivar school in Xalapa, Veracruz. 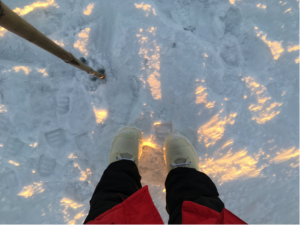 At the Red Cross Nordic United World College in Norway (http://uwcrcn.no), foundation year students have been discussing the PIPERS expedition during their English language class. Students at the Red Cross United World College hail from Cambodia, Western Sahara, Thailand, and Nepal. 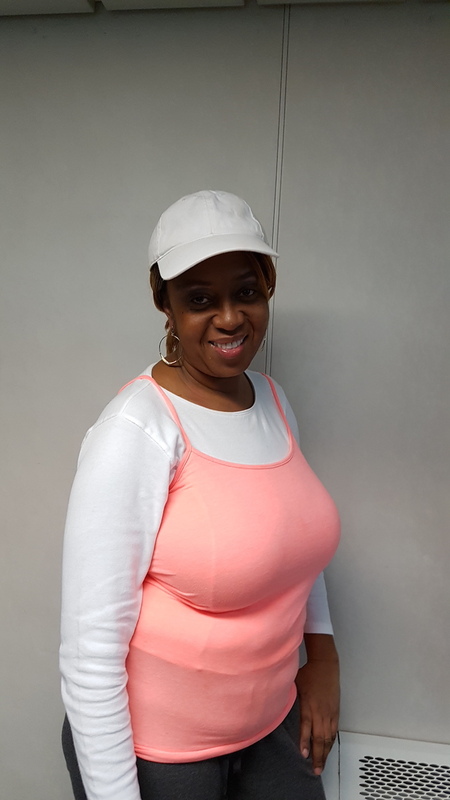 The students posted some excellent questions and PIPERS participant and global modeler Laetitia (Lettie) Roach was corresponding with them through her friend and their teacher. 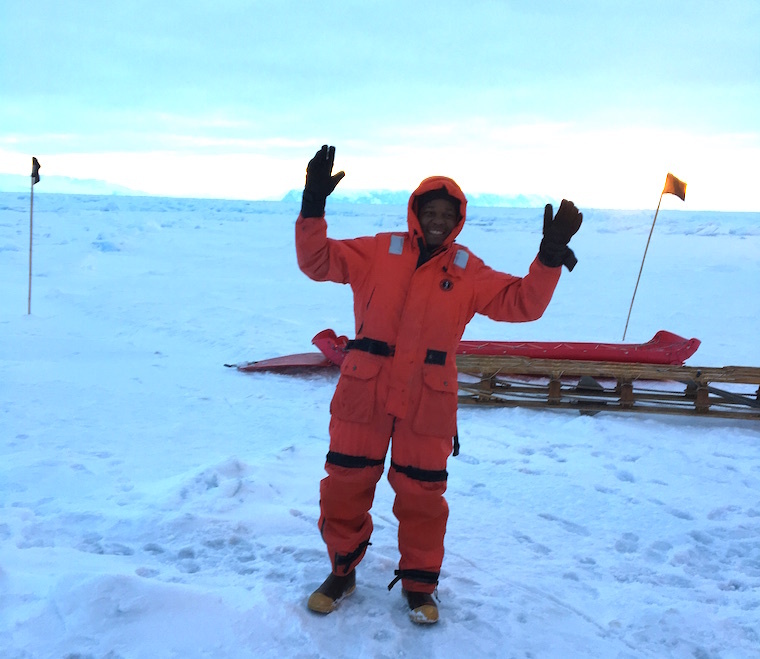 Winter in Antarctica isn’t always auroras and penguins – the chance for high winds, snow and rapidly changing conditions is a real factor that affects our day to day life on the ship. A fair portion of the science during PIPERS is weather condition limited. CTD casts and anything involving a crane, like a zodiac deployments, have wind speed cutoffs to ensure safety of equipment and crew. On ice operations require good visibility in addition to reasonable wind speeds. To complete the desired science, the PIPERS team needs to have a good idea of what weather will be happening and where there might be conditions more conducive to science. Most sea faring vessels receive a once daily weather condition update that gives estimates of conditions for the next twenty-four to thirty-six hours in the vessels intended operational region. The source of these forecasts varies depending on where the ship is. The Palmer presently receives hers as a SPAWAR report from the forecasting team in McMurdo. 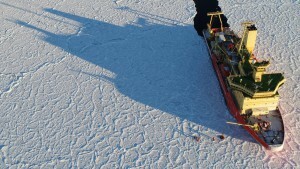 The challenge in forecasting for the Palmer is that the vessel is constantly changing position to achieve the scientific goals of PIPERS, and the weather can change dramatically over short distances in space and time. Add in the fact that one of PIPERS goals is study ice production as a result of katabatic wind events (where pools of cool air rush down from higher to lower elevation creating an intense and localized jet) and the weather situation on board the Palmer becomes more intricate. Dramatic wind speed changes during the peak of a katabatic event as illustrated by the ship’s on board measurement system. PC: Bettina Sohst. Enter the PIPERS forecasting team – John Cassano, based in Boulder at the University of Colorado, and myself, Kelly Schick, also of University of Colorado but presently based on the vessel. We’ve worked out a system where John will email in his review of the latest AMPS (Antarctic Mesoscale Prediction System) model run so that his forecast typically arrives before we begin day shift operations. I’m up early in the morning to assess current conditions and prepare a weather briefing to the bridge. Of course, during PIPERS there are operations ongoing twenty-four hours a day. That means that in addition to an update at the nightly science planning meeting I’ll prepare a second briefing for the science groups and the bridge. 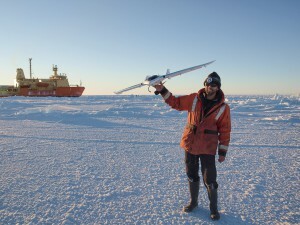 While we were in Terra Nova Bay, I would pull down automatic weather station (AWS) data from a network supported by the University of Wisconsin. 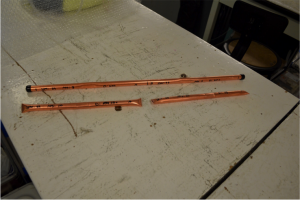 This enabled us to have a better idea of the timing of katabatic wind events and help communicate their strength to the science team and crew. While I wasn’t brought on board to be “the weather girl”, it’s a role that has become part of my daily routine – and an enjoyable one at that. 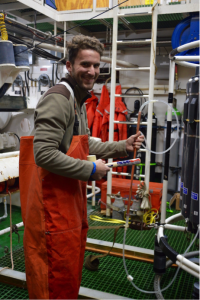 Through my interactions with the bridge crew I’ve had the opportunity to learn about ship operations, ice characteristics and past experiences in the region while also having some funny moments to lighten up the mood. 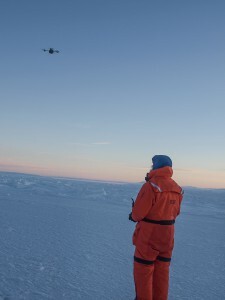 Weather in Antarctic is a large branch of an incredibly dynamic system. While the forecast models we use (primarily AMPS – the Antarctic Mesoscale Prediction System) do an incredible job, there are processes that can’t be resolved in the model due to their small spatial scale. 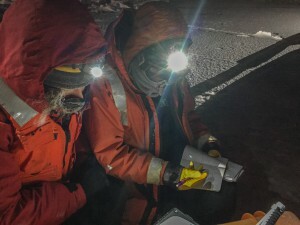 Our experience in the katabatic winds drove home the importance of being aware of the weather as well as emphasizing how quickly conditions can change. 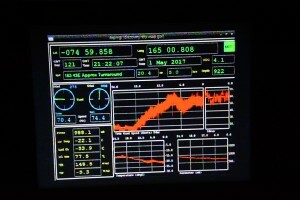 The ship has her own set of meteorological information that streams constantly on the screens in the main lab that allows the changes to be quantified and recorded on a local scale. Due the remoteness of the region we are studying, meteorological data is scarce. In the States, there are multiple radiosonde (weather balloon) launches performed nationwide two or more times per day, along with extensive automatic weather station networks even in relatively remote areas to provide continuous data for live information on conditions and to use for initialization in forecasting models. While there are a few automatic weather stations in Antarctica they tend to be clustered in coastal regions near the main bases. We are very fortunate to have the AMPS models to place our observations in context and hope to understand how weather conditions will develop. The added challenge of piecing together bits of data, different interpretations and watching the science happen in real time makes it more of an adventure. Murder! In the cargo hold. With a slice of toast. Lying, deceit and paranoia have taken over the ship as friend turns on friend in pursuit of glory as the final survivor. For the past week, our morale team have put together a game of Assassins. Each participant is assigned another person on board, with a location and a “weapon”, and has to try and concoct a plan to get their target to go to that location where they can be “killed” by a quick tap of the weapon. Weapons can be as concealable as a Sharpie, or as bulky as a gym ball. Bettina, found in the wet lab, murder weapon removed from scene. Murderer still on the loose. I sadly died on day 2 via weather balloon, after amassing a kill streak of 3. The traditional adviser-student hierarchy has been temporarily suspended as the young unapologetically kill the old. The game continues… May the odds be ever in your favour! We are about a quarter of the way into our cruise. It being my first, I feel like I am settling in to boat life well. As with any field work, flexibility is key and Mother Nature has the final say. The last couple of days the winds have been too high to get much work done outside so we have had the time to process samples and data, troubleshoot issues with instruments, and catch up on everything from email to laundry. 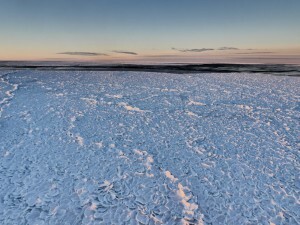 On our way to Terra Nova Bay, with clearer skies and less wind, we were able to get in two successful ice stations. I have been part of the collective effort to complete the ice physics station. 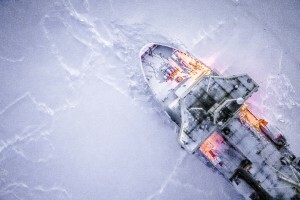 At each station, we use a variety of techniques to map both the surface and underside of the sea ice with the goal of fully characterizing the ice. One of the main campaigns I am assisting with is a LiDAR survey, which provides us with the surface elevation over a 2D grid. 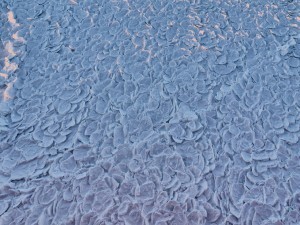 For this, I got to step out onto sea ice for the first time and loved it. With the sun just hugging the horizon this time of year, the shadows and colors are stunning, highlighting the texture of the ice surface. Oh, and the bunny boots keeping my feet nice and warm make all the difference. The LiDAR survey starts by measuring out a 100 m x 100 m square and setting up 6 highly reflective targets that the LiDAR can easily pick up. 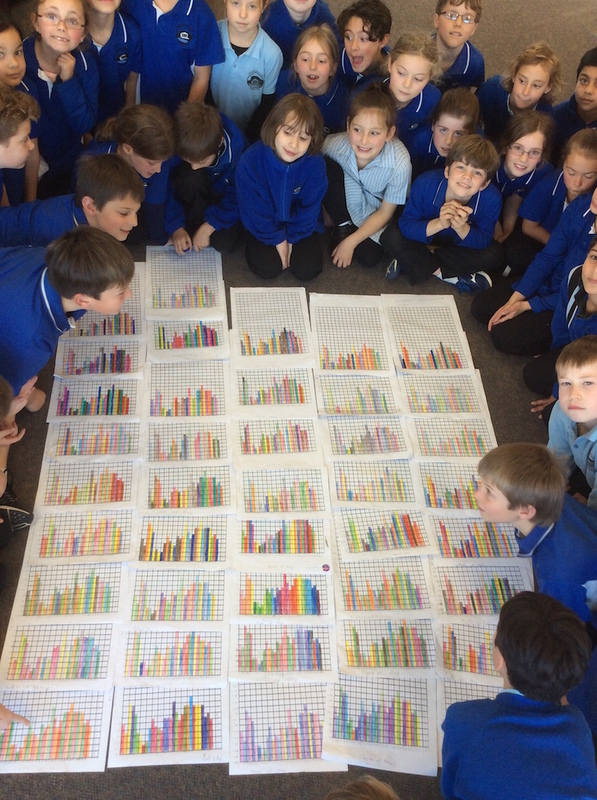 We then do 4 scans, one from each corner of the square. Tying all of these scans together, based on our reflective targets, helps to fill in any gaps or holes in the data that occur from “shadowing”, similar to regular shadows we see from the late afternoon sun. 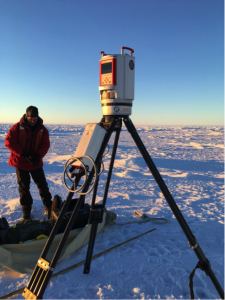 Additional measurements at the physics station are done along a transect, including snow depth, ice thickness, and ice core sampling. 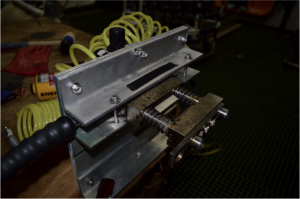 To cap it all off, an under ice survey is done with an autonomous underwater vehicle. All of this information will ultimately help relate airborne measurements to actual conditions on the ground, improving modeling and forecasting capabilities. I feel very lucky to be a part of this immense multi-project effort to better understand sea ice production in this area. Now let’s just hope that the weather cooperates soon so we can get back out on the ice! 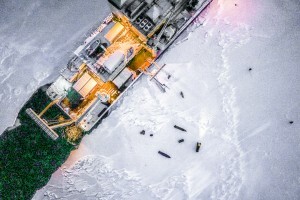 katabatic wind event in the Terra Nova Bay polynya [164 21ºE, -75 S]. NB Palmer from DJI quadcopter. rapture as the cold, dry atmosphere rips out its tribute. up against each other like a gratin dauphinois gone wrong. dragon’s breath, into the Earth’s global overturning circulation.